About to order a boat for 2019. Stuck between the nautique 230 and 23 LSV. From all I read about both boats the 230 requires more added ballast to get a really good surf wake. 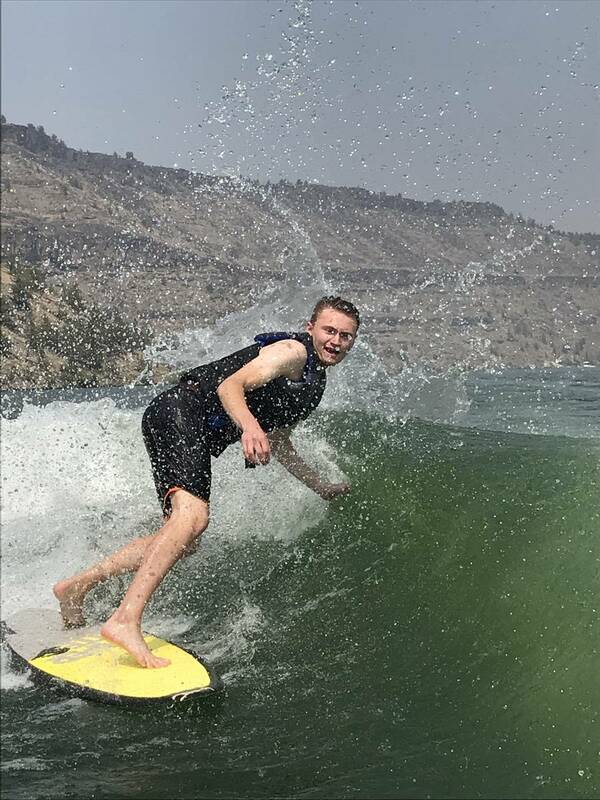 We primarily wake surf with an occasional wakeboarder. Both boats are great and the fit and finish to be are about the same. Need some persuasion? The surf band, oddly enough, is actually very useful. 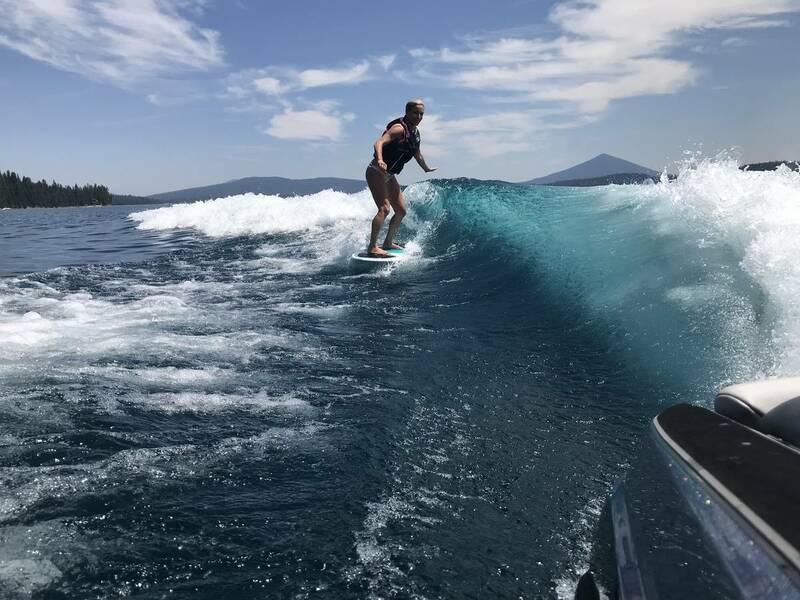 It is a bit of a game changer when a rider can dial in their own different wakes/wave shapes, within a set, on their own. 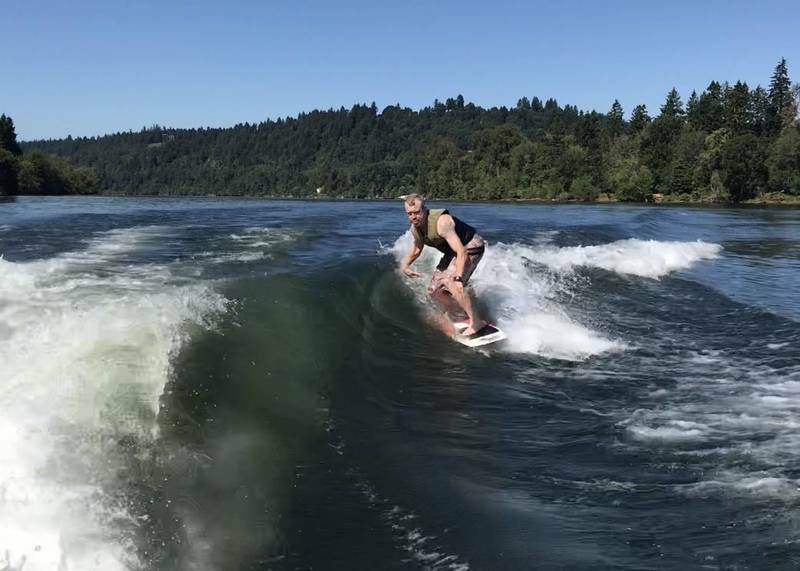 Nautique builds a great boat but the surf wave is better on the LSV; personally I think the fit and finish of Nautique are a bit better though. Cleaner waves and ramps on the Bu in my opinion...and likely a bit easier on the wallet. There are some rumblings that the 230 may be discontinued in the next few years. I’ve been really happy with the 2018 23 LSV this year and run what most call minimal PNP ballast on top of the stock ballast. These surf wave pics are with the rear tanks at 75%, which means my 475 lb PNP bags are closer to 2/3 full and wedge is 2-3 clicks from lift. I have to say there doesn’t seem to be a ton of people comparing these two boats, although the question comes up periodically. What speed are you surfin at? Generally around 10.6, which is the top 2 pics. Bottom one was at 10.0 for a relatively new rider. Dam, I'm a little jealous. I run a similar setup but I don't think mine looks that's nice. I have the 580lbs bags, 100% surf side and 75% offside, same speed and wedge settings. I usually have a smaller crew so maybe that's why. When there's more people and I put the larger ones in the front. Then, hell yes. Could be, although the top pic only had 2 guys in the boat and the bottom pic had 3 adults and 3 kids. The middle one was a pretty full boat. I'm guessing due to the new lower GS line which is more in line with lessor options and the g series being the premium.. I've heard the 230 is difficult to dial in. Will be first on chopping block for a discontinue.. . Especially with the GS line now. GS22/24 more similarly priced to the lsv in comparable sizes than the G Series.. The Lsv is simply idiot proof period.. easy to dial in and a gauranteed resale. If u do end up nautique I would consider anything BUT the 230 IMO.. huge hit on resale with everyone wanting G and maybe GS that surf better all around than the 230 as even a dealer said himself.. Sorry for the hijack. What’s your water depth running? that last pic the water is gorgeous. Hulk very convincing and what a great looking surf wake. How is the push? So no additional ballast other than stock, PnP and people? Top pic was in the river so probably 25-30', and last two were in lakes that were easily 60'+. I'm in a 25 way awesome and probably not much more than a 230 although depends on options so if price isn't a concern between the 230/23lsv then consider 25 lsv And blow all your choices away including a G23. Sorry G fans..
A previous post I compared the 25 to the 23 lsv forget the thread. The 23 is a great wave just PNP and some ppl or if u run light throw a bow sack on the floor.. regardless of what ppl say once u experience a wave in any boat with ppl and without u can't go without.. so the better alternative is adding some simulated ppl weight on the floor! The 25 is even More easy to setup than the 23. Both extremely easy though.. 23 depending on weight may want a little bow weight. Not so in the 25 she just wants belley weight and rides nose lower.. there isn't a huge price Delta between them considering the much better wave on the 25 IMO.. lot more boat for a bit more..
Also in regards to a 230 the bow is tiny and felt like my toddlers would fall out! Very shallow almost feeling dangerous! Thus why I decided on a 23lsv yes back as I myself was between a 230 and 23lsv.. lot more bang for the buck.. the 230 tried to be an everything all around boat but it's not great at anything IMO..
Heck if u want no wake throw a Malibu wedge in lift mode and break out your ski! U would be shocked how little wake is on a 23/25lsv in lift mode! No joke! Now with the new pw3 more lift it might be competition wakes! JK but who knows would like to see! I've just read and heard and seen the 230 be difficult to get dialed in for surf and it ain't that great.. u Never hear about anyone in a 230 bragging about surf waves for a reason..
Malibu will have a longer wave than the nautiques at least the g series.. so longer pocket with more play room. G wave is steeper not my cup of tea as it's brakes on at all times vs setting back and chilling with some front foot weight.. I have not surfed or seen the new GS waves so not sure about those yet.. although I dont understand the GS line seems like they are trying to to go after Malibu pricing but not a big enough Delta between their G Series for an "econo" boat in their line IMO.. maybe G prices will rise significantly are as mentioned they will be optioned up heavier as standard.. If u love surfing then do a 25 lsv and u will Never look back and could be similar price as that 230 . If u must do 23ft or under then consider 23lsv as u will be much happier with a boat that is easy as pie to dial in. 230 = rocket science degree, PNP added...moving ppl and weight to different positions every outing and bla..
25lsv = PNP/wedge no ppl is still better than 23 (within reason) or add bellley weight or ppl anywhere no bow weight ever needed.. same exact setting Everytime regardless of variable or where ppl are setting way longer bigger wave than 23 lsv .. crazy play room. So no additional ballast other than stock, PnP and people? I don't run any additional ballast other than those, but some will use extra up front and the wave just gets better with extra weight/displacement. I agree with Hulk that it's an easy boat to dial in and get a consistently good wave. IHeck if u want no wake throw a Malibu wedge in lift mode and break out your ski! U would be shocked how little wake is on a 23/25lsv in lift mode! No joke! Now with the new pw3 more lift it might be competition wakes! JK but who knows would like to see! I am pretty sure that with the wedge deployed at any angle, you can't go fast enough to ski, it won't allow it. Right? It would seem pretty sweet if they would let you go 30+ with wedge in lift mode. Wrong. You can, it throws alarms the whole time though. Correct dealer said his rep said they do it all the time, shockingly small wakes! Might be annoying but if u really need that ski run in go for it. But IMO you won't do it because you'll be too addicted to surfing.. I just got done comping the GS22 and 23LSV, so not a direct comparison but I ended up with the LSV due to the surf wave customization. The NSS seems to have two options, short and tall or short and short. This is also true on the G23 I've tried. I'm sure one can learn to love it, but the control over the wave with the wedge in a Malibu is industry leading in my experience. Unfortunately, the Nautique helm is in a different class than Malibu. I have had my LSV for a month or so now and dislike the sterio and switch controls more each time I take the boat out. It's slow to respond and clunky in the lower screen (main screen is pretty stable and sweet though). The base PCM motor in the GS and 230 is a true 409 HP. It was way more quiet and smooth than the raptor, but overall performance is close. Wave/wake was the most important thing to me, so my decision was easy. But nautique does a lot of things very well. As everyone would tell you, go test drive them and decide what works better for you, but the LSV performance is going to be hard to beat. I’m not a fan of the Malibu helm/stereo integration. I would imagine (hope) an updated helm would be coming in 2020. They’ve essentially had the same helm since 2015 with minor software updates and the addition of that (useless???) steering wheel remote which mirrors the functionality of the 3-way joystick on the dash. The helm-stereo integration is my final gripe with the 23 LSV. In my 2015 it was feasible to customize the stereo and improve it (I added physical knobs for 3 zone control). Now they have made that extremely difficult to do. So you are stuck with lame touch screen control of the audio system zones. Otherwise, I think Malibu has a great product now. We are getting close to wanting to upgrade again, but not sure I want the first year of a Malibu marinerized engine (though I’m glad they are making the GM 6.2 DI available soon). As much as I want to upgrade this winter, I feel it may be advisable to wait until MY 2020. I will agree with the posts above about ease of dialing in the 2018 LSV. I've been running mine at 10.9 with 580 PNP @ 100%. This pic is with only my two kids in the boat (100 lbs total) and they are sitting in the bow. You will love the New LSV. My $.02, you should definitely try emptying the non surf side to 75%. Makes the goofy side wave unreal and cleans up that lip quite a bit! I feel like I finally had it dialed in last night and a little list made a big difference.